Joshua Green is a senior correspondent for Bloomberg Businessweek and Bloomberg News. He has been a senior editor of the Atlantic and an editor at the Washington Monthly and has written for the New Yorker, Esquire, Rolling Stone and other publications. 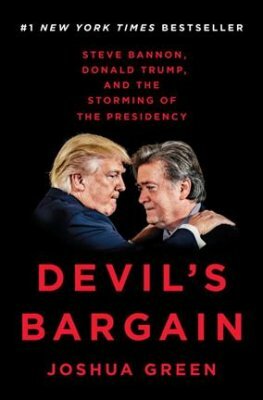 Devil’s Bargain is a biography of Steve Bannon along with his connection to Donald Trump and their combined victory in the American presidential election. There is a tendency to dismiss Bannon’s importance because of Trump, but when you take a step back you realize that this guy did all these things: graduated from Harvard Business School after seven years in the navy, worked at Goldman Sachs for years, went to Hollywood, eventually produced movies, worked in Hong Kong and was appointed with KellyAnn Conway and David Bossie to head the 2016 presidential campaign of Donald Trump. If nothing else, Steve Bannon was a driven, combative, special person. Bannon was working on the deck of the Paul F. Foster when the ship she was following launched the helicopters of Jimmy Carter’s disastrous attempt to rescue the American hostages from Teheran in 1980. Bannon’s hatred of losing was magnified by America’s pathetic response. Many years later, the attack on the twin towers, in an area where he worked, confirmed to Bannon that he was right: the Muslims were attacking America. The racism that Bannon is accused of harboring and which he denies but tolerates, (“Over time it all gets kind of washed out”) is like the use of the ‘Bad Guy’ image to draw attention to one’s self to accomplish an end. They are distasteful but useful props in any theatre, especially the political one. When Steve Bannon graduated from Harvard Business School, he got a job by a fluke and succeeded in Goldman Sachs. He avoided the excesses of the eighties and went to Hollywood with another ex Goldman Sachs employee where he set up a company and got rich. When he met Andrew Breitbart, Bannon recognized his genius and followed him like a disciple. He taught Bannon about catching and keeping online audiences and the media outlets that they use. When Breitbart died suddenly at the age of forty-three, Bannon stepped in as executive chairman of Breitbart News. An example of his good fortune in Hollywood was that a residual he was forced to take in order to make a deal was an unknown comedy named 'Seinfeld'. In Hong Kong he discovered a world of young, intense, male (mostly) underground gamers which he valued and would use in his online media business. When Breitbart attacked Acorn and was humiliated by the revelation of its unfair, wrong reporting, Bannon says he experienced “nuclear winter”. When they exposed Anthony Weiner’s online genitalia a year later, he was a right wing media darling again. Donald Trump was chosen by Bannon instead of the other way around. His boldness and outspoken, rebellious nature were right up Bannon’s alley. Trump’s talk of the wall, which had drawn a visceral response from his audience, was encouraged by Bannon and the powers that be to make sure the candidate talked about immigration. Trump retweeted some of Breitbart’s more outrageous articles and his underdog image was exactly what Bannon liked. Bannon was responsible for Breitbart’s emphasis on Isis, race riots, what he called, “the collapse of traditional values”, and, of course, Hillary Clinton. Bannon said “Our vision - Andrew’s vision - was to build a global, center-right, populist, anti-establishment news site.” It describes Trump’s attitude perfectly. Steve Bannon agreed with Ben Shapiro’s description of his style, “Truth and veracity weren’t his top priority… Narrative truth was his priority rather than factual truth.” Ben Shapiro was a Breitbart writer who quit over differences with Bannon. When Bannon started to become more popular than Donald Trump, when he became known as the power behind the throne, he was fired. As long as Donald Trump continues to govern the USA as if it’s a company and its citizens are his customers and Steve Bannon keeps up his holy war’s shock and awe attacks, it’s impossible to conclude that the story of these two men ends here.